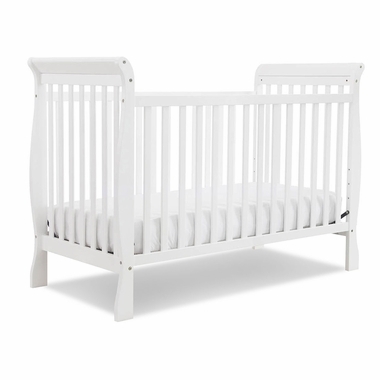 Classic and traditional architecture, the Da Vinci Jamie 4 in 1 Convertible Crib has a graceful and beautiful style for any style. Clean white is used for the finish and accentuates many colors to create an item that can be used for years to come. Built from the substantial New Zealand Pine forests, this wood is harvested in controlled environments for a safer tomorrow. This crib converts into four different sleeping stages to grow with your ever-changing baby and help give a smooth transition. Combine the crib with the matching Emily case pieces for a beautiful nursery.